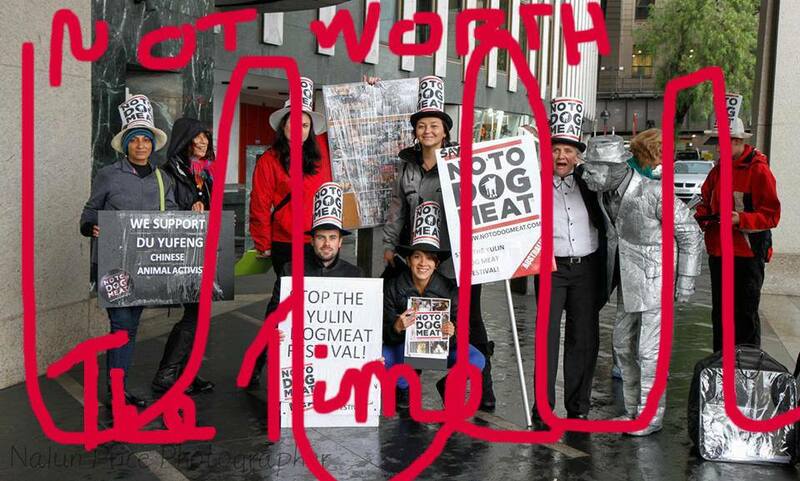 May 2013 | Who is No To Dog Meat? Who is No To Dog Meat? and who is The World Protection for Dogs & Cats in the Meat Trade? This new organisation hit the ground running in May 2013. It wants our financial support. We are entitled to ask questions. There is no regulatory body we can ask. Doubts about the veracity of this new organisation grew when questions about their charitable status remained unanswered. Their goals were overly enthusiastic and their promises unrealistic. In describing their charity, information on their status was smothered in rhetoric. An ID number, purporting to be their charity number, was shown in the about section on Facebook and then deleted from the description. It reappeared some time later but as the number of a UK limited liability company registration. We discovered that this number was for THE WORLD PROTECTION FOR DOGS AND CATS IN THE MEAT TRADE. This recently incorporated company is described as the ‘umbrella’ of NTDM. Donations made through PayPal go to this company. This means that the company is registered for tax purposes and it protects the owners from liability. The officers of the company are required to keep day-to-day financial records and to submit accounts for tax purposes annually. Providing they annually declare income and expenditure and duly submit all documents as required under UK law for incorporated companies they are behaving correctly. That does not mean that they cannot spend their income on jetting all over the world and staying in fancy hotels if they so decide. That does not mean that they need to spend a brass farthing on saving cats and dogs. They are not required to send money to help shelters. They now describe themselves predominantly as lobbyists, and as such scorn surprise by donors that their animal rescue contribution is minimal. As their campaign manager says himself, they can do what they want with your money, “.. BUT LET THIS BE LOUD AND CLEAR FOLKS. You are not donating so YOU decide where our charity spends the money. You are donating so YOU get credit in the bank to decide which dogs live and which dogs dies.” He should know since the money collected by the Thai chapter of NTDM for saving dogs in S Korea was sent to him in the Philippines, but more of that later! Once we had established the criteria of the ‘umbrella’ company, we searched in vain for their registration with the UK Charities Commission. We ignored the various references they make to being registered under a French law for associations. They describe it incorrectly as an EU law. Reports of donations given indicated that NTDM had received in excess of the £5000 ceiling exoneration from being required to register with the Charity Commission. One would expect that a charity asking for peoples money would lay out their stall for all to see; that questions either on FB or by email would be answered politely and concisely. The information here we had to find for ourselves, it should not have to be that difficult. In normal circumstances we might have excused their prevarication, misleading statements and downright rudeness, believing that they were just a bunch of amateurs finding their feet. What alarmed us about their apparent incompetence was that they were being led by a Barrister. It seemed truly incomprehensible that a UK Barrister would not appreciate the need for complete transparency when heading a charity. We asked pertinent questions on Facebook which gave them yet another opportunity to respond calmly and clearly. Instead they reacted aggressively. Some of us were branded hate mongers. Pages were trolled and were constantly reported to FB for mentioning their name. People were trapped into responding to comments made by fake FB identities only to be reported and put into FB ‘jail’ for days. It became very nasty indeed. By the end of June 2013 the disillusioned Sidney and Melbourne activist chapters of NTDM withdrew their support. Some of these members, because they could get no satisfactory discourse with the NTDM founders, expressed their dissatisfaction on FB. While questions were being asked on FB about the charitable status of NTDM, their enthusiastic Australian supporters in Sidney & Melbourne were having problems. Receipts were not forthcoming, questions were not answered, people who asked questions on the official FB page were being blocked and their comments deleted. Several of them were holding batches of signed petition, which seemed of no interest at all to NTDM. It was hard work collecting the signatures, and very disappointing that NTDM were only interested in photos of supporters protesting on the streets wearing their Logo. One person recently reported to still trying to find a home for 1200 signatures gathered. The Sidney and Melbourne chapters became increasingly uncomfortable with the posts on the NTDM page. 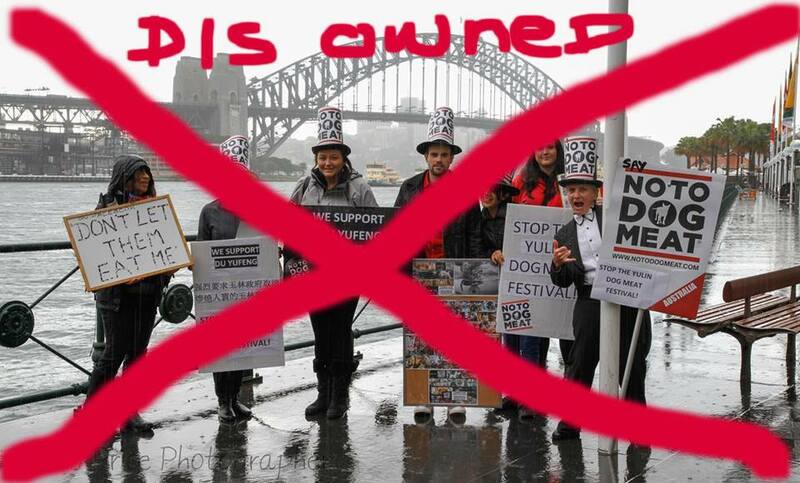 Although by this time dubious, a Sidney woman, who had made substantial donations, nevertheless decided to help organise the Sidney Australia protest against the Yulin dog eating festival under the NTDM banner. The posters this group of street protesters used, paid for themselves, also promoted Du Yufeng of Bo Ai Animal Protection Centre in China. Du is a well known activist and animal rescuer in China. She and her group were campaigning at the Yulin festival, these grass-roots activists bravely campaigned before and during the festival. The decision by the Sidney chapter to include material promoting Du and her group, when protesting, was not received kindly by the CEO of NTDM. Which may be why NTDM issued a misleading statement concerning Du Yufeng. 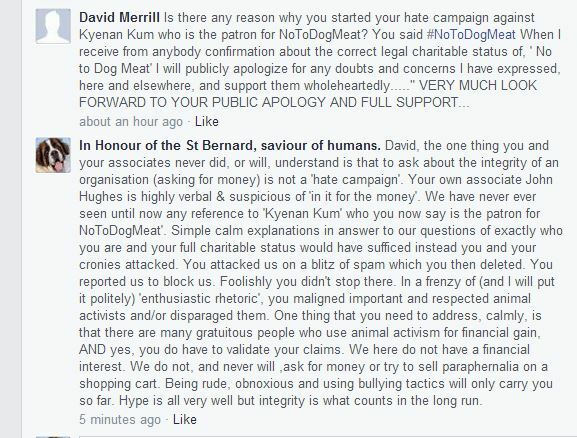 The response from ‘Hand in Hand with Asia’s Animal Activists’, refuting the misleading statement after being in direct contact with Du, is shown in this capture. Click on the captures to magnify. Towards the end of July 2013 word was received that the Thailand chapter of NTDM had withdrawn their support and were demanding the return of the 2,200 US dollars raised by them for the Thailand EVENT. Two members from the Thai chapter, arranged to fly to S. Korea to join Ms Brown, the film maker/journalist and co-founder of NTDM. On arrival in Seoul, and In spite of waiting all day, they were refused a meeting. They had taken with them filming equipment to record, for the Thai chapter members, Ms Brown’s visit to S.Korea; to show their fellow donors how their donations were being spent on saving dogs from the dog meat trade in S.Korea. They had with them additional funds to help with the rescue of dogs from Moran Market. These funds were finally donated by them to CARE, the dog rescue organisation they visited in Seoul. Left stranded in Seoul, the representatives from the Thai Chapter risked a visit to the notorious Moran Market, and a less dangerous market, to bring back remarkable footage of their experience. Money had been donated on a fundraiser to send Ms Brown to film at the Moran market. The video made by Ms Brown caused a minor uproar on Facebook; it was hugely disappointing, whereas the video brought back by the self funded Thai Chapter representatives is excellent. Doubts were expressed as to the authenticity of the ‘rescue’ of two dogs by Ms Brown. Many believe that Ms Brown visited another, less dangerous market, to buy from a pet dog vendor. The Thai video seems to support this theory, the reaction to them when they tried to buy a meat dog at the Moran Market was very dramatic. Ms Brown on the other hand spent most of the video choosing two out of four dogs, brought to her in a very clean cage by an affable vendor. She petted and stroked the dogs, just as a potential purchaser of a companion animal does and not as somebody buying to cook it! Controversy escalates as UK animal charity withholds funds donated to Chinese animal rescuer.